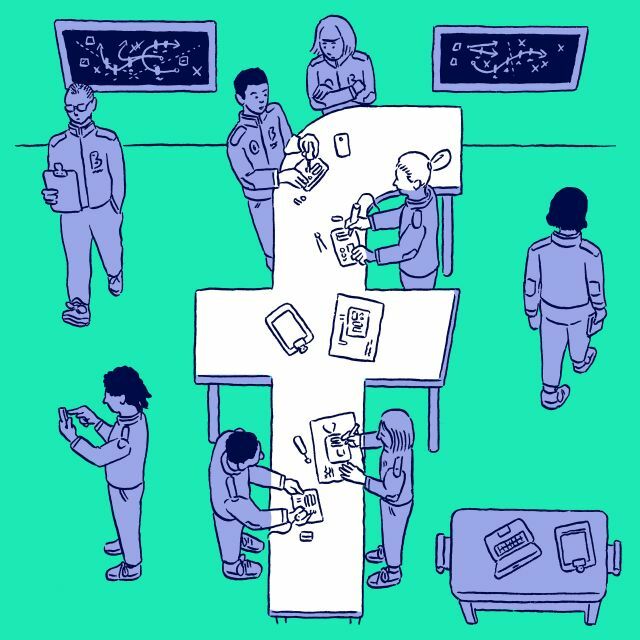 Facebook attracts 1.28 billion daily active users, so it’s little wonder marketers are drawn to it. It’s not just the size of the audience that makes so many of us jump in and give Zuckerberg a good chunk of our ad budgets, the real draw is the ability to target a very specific audience. By this point, most marketers have several ideal client avatars safely stored in their files. This well-researched resource is a detailed breakdown of what the people we want to reach are like. We know how old they are, what they do for fun, how they spend the weekend and what websites they shop on. Retargeting tactics have given us the power to follow them around the web. Marketing is getting hyper-personal. 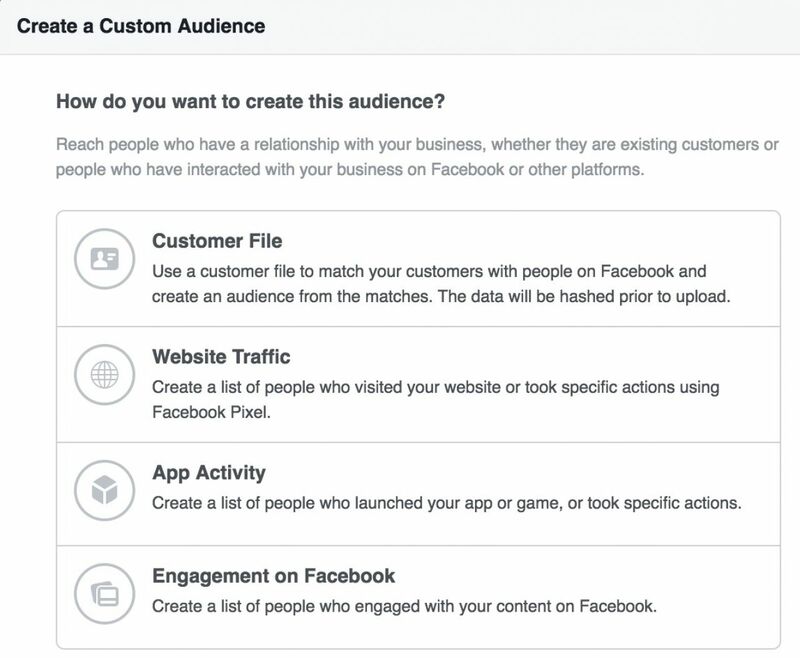 Facebook lets you use this information to create custom audiences, decreasing the cost of customer acquisition. The ads are affordable, and as more businesses flock to the platform, Facebook has continued to make improvements to its advertising features. Learn the secret ingredients professional marketers use in their most profitable ads. If you already know what you’re doing and are just looking for a Facebook video ad maker, check out Biteable. Our templates are super easy to use, and you can get started for free. 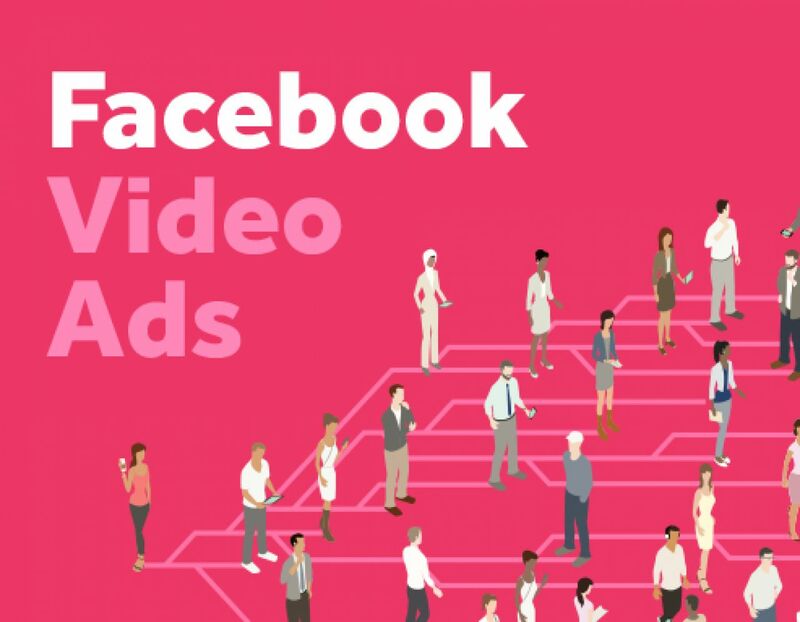 If you want a detailed breakdown of what you need to know about Facebook video ads, let’s dive in. Running an ad without an objective is like driving from New York to LA without a map. Yeah, you might eventually get there, but it’ll take you a lot longer than it needs to. Set a clear goal for each ad campaign and decide how you’re going to measure ROI. Video views. A solid objective if your goal is to get your video in front of as many people as possible. Brand awareness. Facebook aims ads with this objective squarely at the people most likely to respond to it. Reach. By itself, reach isn’t the most useful objective, but if you’re running an awareness campaign it could be an interesting one to experiment with. App installs. If you’re running an ad that’s linked to an app, and you want to encourage downloads, this is a great objective to optimize for. Click-through traffic. Great for driving people to a landing page. Engagement. This is handy for raising awareness, and for starting conversations. Lead generation. Is your goal to get as many leads as possible? This objective sets your ad up to help you get emails. Conversion. Track specific actions, like website visits, that lead to a conversion. Great for list-building or signing up for an event through the ad. Product catalogue sales. If your goal is to actually sell products through Facebook, this is the one for you. Store visits. Want to get potential customers over to your e-store? You’ve found your ad style. Pick an objective that will help you reach your goals. Each one is designed to maximise ROI, and decrease the acquisition cost. Facebook wants to help you hit your goals, because that means you’ll be back, and potentially giving them a bigger share of your budget down the line. 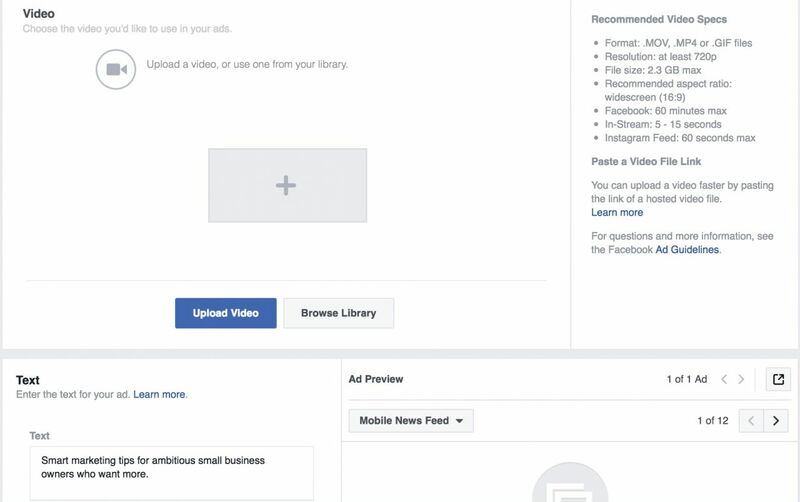 Before we dive in and show you how to create a Facebook video ad, let’s go through the ad specs. Sticking to these will set your ad campaign up for success. Facebook supports a number of different video formats, including 3g2, avi, mp4 and mpg. For a full list of all the supported formats, check out Facebook’s exhaustive list. Once you’ve made sure your format is supported, upload the video to Facebook. For best results, high quality video trumps everything else. 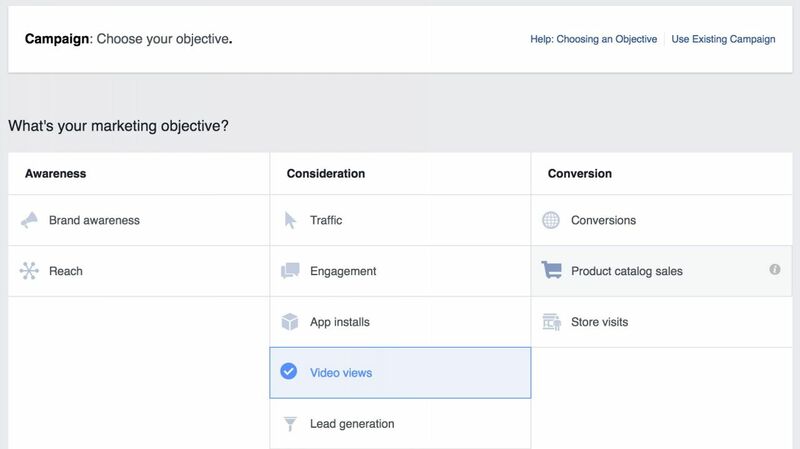 Make sure your Facebook video ad specs are up to snuff! Technically, if most of your audience are likely to view your ad on a desktop, use the 9:16 ratio. If you do, make sure the key parts are visible in 2:3, as that’s how the video will appear in mobile. To be honest, it’s best to optimize for mobile from the start. You can use the 2:3 or the 4:5 ratio to make sure your video renders beautifully. When it comes to file size, Facebook supports files up to 1.75GB, but let’s be honest, the only successful ad that big was Mission Impossible: Ghost Protocol. Most of us don’t have the budget to have Tom Cruise use our products to save the world (again). While the length of your video really is up to you, shorter videos tend to have higher view rates. Ultimately, the only way to know if something will work for your audience is to test it. If you’re convinced that a ten-minute tutorial will get viewers to sign up for your next event, you should test that hypothesis! Run a limited ad campaign and analyze the results. As with everything else in marketing, the stats we share aren’t bulletproof, but they are a good starting point for your own tests. It’s not only technical requirements you need to be aware of. Facebook has fairly strict policy guidelines on what your ads can and cannot include. You can see Facebook’s full advertising guidelines here, although much of it should be common sense. 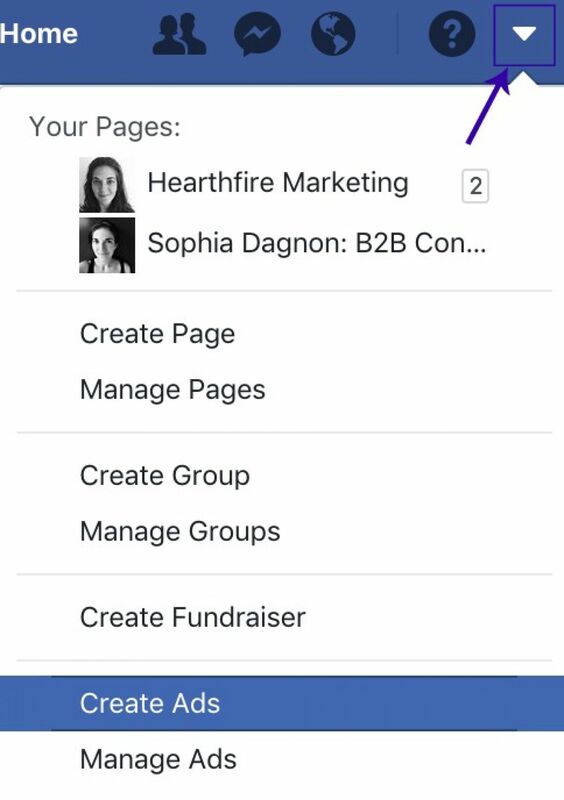 Log in to the Facebook account linked to your business page, then click on the arrow in the top right-hand corner to open the drop-down menu. 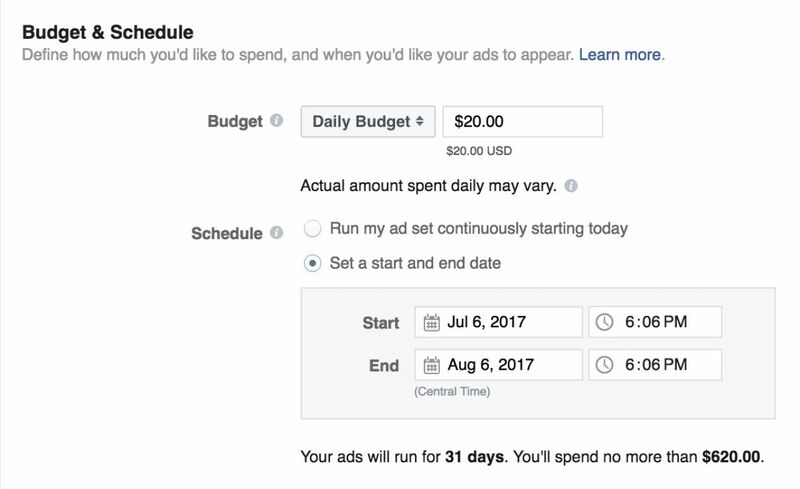 Select ‘Create Ads.’ If you haven’t set up your Facebook ad account yet, you’ll be asked to do so. Just follow the instructions and come back to this part once you’re done. Pick the objective that most closely aligns with your ad campaign. For my test campaign, I chose video views. Once you’ve decided what your objective is, name your campaign and click on ‘Continue.’ Make sure your name is something that makes sense. To make it easier down the line, you could include your objective for it in the name. This is where Facebook really comes into its own. You can use an audience from a previous campaign or create your own custom audience. It’s this kind of precise targeting that makes Facebook ads so effective. You can match your custom audience to an existing customer file, target website visitors if you previously installed Facebook tracking pixels, or deliver the ad to an audience that has already engaged with your Facebook content. You can also include or exclude people based on factors such as demographics, location or interests. Use your customer avatar research to dive deep and identify people most likely to become a customer. 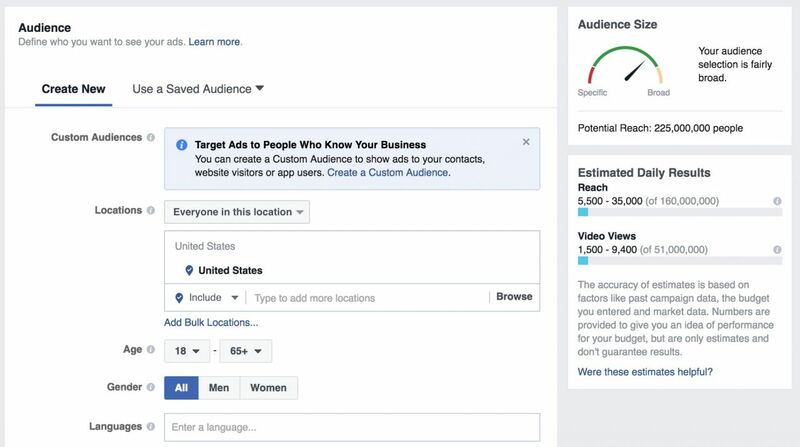 Once you’ve created a target audience, choose where you’d like Facebook to place your ads. 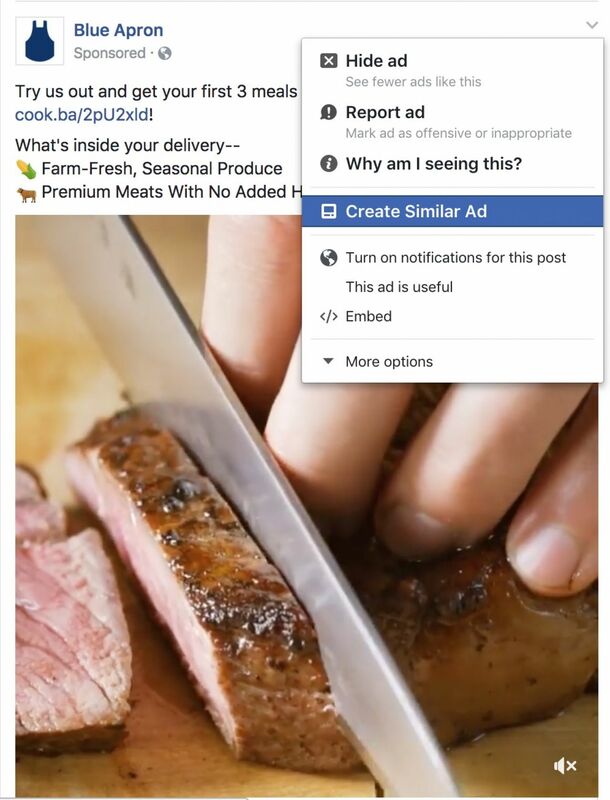 You can either let Facebook place them automatically, or you can edit where your ads appear. If you’re just starting out, it might be a good idea to start with automatic placements. It’s in Facebook’s best interest to put your ads in front of the right sets of eyeballs. How much are you comfortable with spending on this campaign? You can set a daily budget or a lifetime budget that the project can’t go over. To keep potential spending from getting out of hand, either set a daily budget with a distinct start and end date for the ad, or set a lifetime budget. You can display your ad as a single video, in a slideshow, or as part of a carousel with 2 or more other videos. Facebook recently added a new full-screen option for mobile users. The full-screen Canvas Ads are optimized for mobile devices and work well with a few different ad objectives. It’s time to add the pièce de résistance. Upload the video from your computer or use one from your library. Once the video is uploaded, you can add text through the box in the bottom left-hand corner, and preview the ad in the box in the bottom right-hand corner. When you’re happy with what the ad looks like, hit ‘Place Order’ and you’re good to go! Crafting the perfect ad is hard. Sometimes you wish you had a checklist to go through. That’s why we put one together! Keep it short. Facebook ads are interruptive. If you want the viewer to stop and pay attention, you need to keep it short. Ads that fall between 30 and 60 seconds have the highest completion rate, at 44%. Use text. Did you know that 85% of all Facebook videos are watched with the sound off? If an ad is captivating, a user may stop scrolling long enough to take a second look. Make sure they can actually understand what’s going on. Set your ads to autoplay. Most videos on Facebook start autoplaying as soon as a user scrolls past. This gives them their best chance to get noticed. Make sure you give your video its best shot. Make the first 1-2 seconds attention-grabbing. Start your video off with a bang. It can be a literal bang, an engaging question or some really exciting titles. At this point, the user hasn’t switched their sound on yet, so you’re relying on visuals alone. Get to the point quickly. An ad isn’t the time to waffle. Provide value right away and tell the viewer what to do do next. Focus on what your audience needs. The best ads are the ones that make you look over your shoulder for the creepy marketer that knows you better than your own family. Keep your avatar firmly in mind when creating your ad, and speak directly to them. Offer something that will actively make their life easier. Make the ad engaging. The most memorable ads tend to hit us straight in the feels. Some are funny. Some are heartbreaking. Choose an emotion you want your ad to elicit in your viewers, and use some basic psychology and storytelling to drive it home. Include a clear Call To Action. Someone watched your ad. Now what? A clear CTA lets the viewer know exactly what you expect them to do next, whether it’s to sign up for a webinar, do 60 jumping jacks, or follow your page. Review performance and tweak as necessary. Don’t set your ad on autopilot and forget about it. Check its performance, and feel free to adjust the language of the copy or the target audience to get better results. If you aren’t sure what part of the ad is working and what isn’t, run some A/B tests, only changing one thing at a time. A checklist is all well and good, but seeing some real-world examples can help you see the theory in action. The great thing about Facebook ads is that you can mould them to fit your marketing goals. This ad by course-hosting platform Thinkific reveals their newest feature. It taps into a burning question that bothers their ideal customers. Course creators worry about the security of their subscriber’s data. A data breach, even if it isn’t directly their fault, can destroy customer trust and bring down their business. Thinkific are using the launch of this new feature to inform potential customers and answer an important concern, hopefully gently nudging them to take one more step down the customer’s journey. What’s keeping your customers up at night? Share your answer to that question through an ad. Unboxing videos aren’t just for YouTube. This ad from ButcherBox shows us a customer opening their delivery with her family. It’s a stroke of genius. ButcherBox show us social proof while directly appealing to one of their ideal customers — the busy parent who wants to cook quality food but doesn’t have the time to go shopping. Successful Facebook ads don’t need to be glossy or have high production values. The point isn’t to impress other marketers with your awesome video-making skills, your goal is to captivate your audience. This ad does that by using user-generated content to simultaneously appeal to an ideal customer, show social proof, and highlight they care about their real customers. Can you tap into your own user-generated content? Sometimes sitting in a chair and speaking directly to the camera can make for a good ad. Melyssa Griffin, the Pinterest savant, is using Facebook ads to advertise a free Pinterest workshop that addresses a major pain point for bloggers: getting more subscribers. It’s short and sweet. Melyssa shares a couple of sentences about her own success with Pinterest, introduces the offer’s potential, and ends with an effective call to action. The ad is the start of a nurturing campaign that will eventually offer the subscriber one of her Pinterest courses. This is a great ad format for building your list and raising awareness. Identify a key pain point your audience is experiencing that your product solves, then create a short training course that can provide value and help your audience get closer to their goals. This ad from the BodyBoss Method teases the product. It shares one potential workout and hints at the results from the rest. You can use this approach to tease customers, and share a bit of your product. If you’re advertising an e-course, share one technique that will help your viewers start chasing their dream. Give them something they can apply immediately and get them curious about the rest of what you’ve got to offer. Creating great Facebook ads is half science, half art. Your own Facebook feed can be a great source of inspiration. Scroll down and see what ads Facebook is throwing your way. What do you like about them? What can be better? You’ll be taken to your ad account and the new template will mirror the one used by the ad you like. This is a great tool for beginners and experienced marketers alike, as well as a handy way to do some spying on the competition. Facebook ads come in all shapes and sizes. You can run an ad using user-generated content like ButcherBox, record a short video from your office like Melyssa Griffin, address a burning pain point from your desk like Thinkific, or offer a free morsel and tease the product like BodyBoss. An alternative and potentially easier option is to use Biteable as your very own Facebook video ad creator. Decide what style of ad you want to make, then jump over to the site and chose one of our free templates. It’s a quick, easy and affordable way to craft a high-quality ad that can support a number of marketing goals.